We are proud to have a team of caring and responsible pet sitters who absolutely LOVE pets. All of us have pets of our own, and many of us have professional veterinary experience and/or years of experience caring for friends’ and family’s beloved pets. Most of our team has been certified in American Red Cross pet first aid. We have over 60 pet sitters up and down the East Coast of Florida. Scroll down to see an image, the sitter’s name and location of some of our sitters. Please note that we assign pet sitters based on service area (clients are assigned the sitter who lives nearest to them). I am the Owner at Dog Days & Cat Naps. I moved my family to Nocatee last year, and am an active member of the community, a loving husband and father of 2 boys, and a pet sitter! I have three dogs of my own, Paolyn, Celine & Georgina, who I entrust to our own pet sitters when I am traveling. I have an authentic passion for this business, and consider myself to be a heart-centered leader. I truly love what I do. I lead my team with intention and purpose, and approach the business, the employees, the clients, and the work we do with enthusiasm and a win-win mindset. I am grateful to be serving in this outstanding community, and look forward to growing Dog Days & Cat Naps along side my incredible team of fellow animal lovers! I am the Head of Operations at Dog Days & Cat Naps and I have been pet sitting for many years. I am a certified Veterinary Support Assistant and I have certifications in Pet First Aid/CPR, Animal Psychology, Pet Nutrition, Animal Training and Pet Sitting. I have rescued, fostered and adopted many animals in my lifetime. I began caring for my family's dogs and cats at a young age. As I grew up, my experience caring for animals broadened from dogs and cats, to reptiles, rodents, birds and fish. I currently have 4 dogs and 4 cats that I spoil rotten and I promise to treat your pets as if they were my own. My name is Amanda, and I am the Reservations Manager for Dog Days & Cat Naps! I am also a pet sitter, working primarily with clients who need Private Boarding or Doggy Daycare services in my home. I have lived in Saint Johns County since 2010, and have served the community in many different ways during my time here. I absolutely love what I do, and the experience of sharing the love that comes with caring for our customers’ pets! I have 2 boys who also love my job and the pets who get to come hang out in our home. 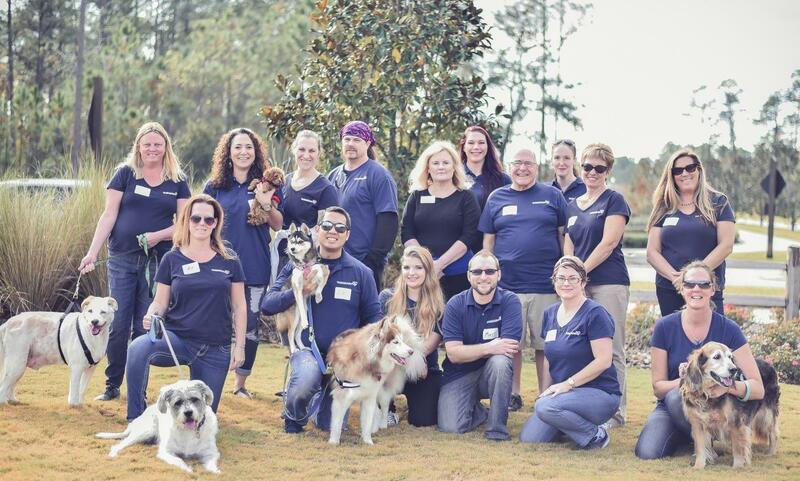 I look forward to continuing my work with this amazing company, and meeting and building lasting relationships with you and your furry family members! I am a Pennsylvania native, spent most of my adult life in Northern Virginia and have lived in St. Augustine for twelve years. My career was spent in health care administration and I am now retired. I have had a dog and/or cat for all of my life ( I received my first dog, a beagle, when I was 5). I have three grown sons. When they were young and living at home each one had a pet; two dogs and at least one cat at all times. I have two chocolate labs at the present time. I am and always have been an animal lover. I love working for Dog Days and Cat Naps and look forward to caring for your fur/feather babies. My name is Megan & a bigger animal lover you will not find! I moved to Jacksonville from Orlando about 2 years ago to be closer to my grandkids. I love animals of all kinds and grew up having a variety of pets. I have always wanted to work with animals so after retiring from the transportation industry, I decided it was time to do what I love. Dog Days & Cat Naps has given me that opportunity & are a great team to work with. When caring for your pets, I go above and beyond peoples expectations! I currently have 1 dog & 4 cats which are all rescues. Hi everyone! My name is Lisa and I have been with Dog Days and Cat Naps for over 10 years. I mainly pet sit in the Intracoastal area but I have and will go wherever I’m needed…to the Beaches, Southside, Arlington and beyond! I love all pets and I am an avid cat person and have several of my own. My husband Jim also pet sits and dog walks in the Intracoastal West/Beaches areas. Hello. My name is Stacey. I have been a dog walker and pet sitter with Dog Days and Cat Naps since 2015. I live in the Mandarin area with my husband and son. We have 1 dog, a beagle mix and 2 domestic short-haired kittens. I love working with and taking care of all animals. I will treat your pet (s) like they are my own. I originate from Central Florida but have called Jacksonville home for the last twenty-one years. I graduated from UNF with a degree in Education and taught for four years. My husband and I decided I would stay home and homeschool our children. Which, I have graciously done for the last 12 years. They are 12, 9, and 4 and keep me busy! Pets have always been a part of my life. But over the last 15 years that love has blossomed. We have fostered many animals that seem to find their way to us! This past year we had the opportunity to raise 5 orphaned squirrels that we have since released. We still see them in our backyard daily! Besides the squirrels, we have a house full of blessings of all varieties. Working with DDCN has been a blessing and has given me the opportunity to serve other families. Growing up in Fruit Cove my home was always filled with various pets and rescued strays, I learned early of the endless love of dogs and intelligence of cats. After 10 years in food service and management I found a dog walking company and haven't wanted to do anything else since. I've taken care of almost every breed from a Chihuahua to a Mastiff and I've loved every minute. Getting to come back and work with DogDays and CatNaps in my hometown has been an absolute pleasure. My name is Hannah and I am a huge animal lover! I currently have two dogs, two kittens, and three birds. However, I have worked with a raised a multitude of animals. Animals have always been an important part of my life and I plan to incorporate them into my career in behavioral psychology for which I am currently in school for. Whether your animals are furry, feathered, scaley, or anything else I would be thrilled to take care of them for you! I live off of the 210 corridor in St John's County. I have been pet sitting for Dog Days & Cat Naps since 2014 and I am so happy to be a member of their team! Taking care of all varieties of animals isn’t just what I do, it’s who I am. I live in the Jacksonville area and have been working for Dog Days and Cat Naps Pet Sitters, and servicing Jacksonville and the surrounding areas for the last four years. Before Dog Days, I was raised with dogs and have a dog and cat of my own. Now I want to care for your fur, feathered, fish and scaled babies, as I do my own. I have a repeat clientele, because looking after your babies is who I am. I make repeat house calls, medicate pets, stay overnight as needed, water your plants, pick up the mail, secure your home and keep your furbabies happy. Hi! I'm Diane. I live in Murray Hill. I retired last year and have been with Dog Days and Cat Naps for over 8 months. I have always had fur babies. Upon retiring from 39 years as an elementary school teacher I wanted to stay active. I am already involved in doing music with my husband at community and church events. However, I wanted to do something else that would be giving and positive. I've always had at least one pet, usually more, since I was nine years old. I really wanted to work with animals, any kind! At the time, the Zoo didn't have openings for non-biology majors but then I found Dog Days and Cat Naps! I was very impressed with their professionalism, integrity and caring attitude. Now, that I work for them I am so glad to be a part of their team and love what I do! Hi, my name is Olivia. I have never lived in a home without a dog or cat in the past 36 years :) I love animals! I have a 4 year old lab/golden retriever mix named "Rhapsody" and a cat, "Lucy". What I love about our pets is that they remind us to slow down & take peaceful moments. And most of all, they remind us to laugh and not take life so seriously! My family always owned dogs while I was growing up. I’m very comfortable around dogs and cats. I really enjoy being around animals. I love to exercise and people are always telling me I have a special connection with their pets. Very often people have expressed surprise that their pets like me so much as they usually don’t like strangers. I am currently a student working on my degree. Hello I'm Novella and I love animals! I l care for all animals as if they were my own! I ensure every animal is cared and loved while their owner is away! I am an animal lover! Dogs and cats (along with some hamsters and fish) have always been a part of my life. Presently I have 2 dogs and 3 cats, plus I feed a wide variety of feral cats on my front porch. I love all of their unique personalities and the companionship they provide. Pet-sitting provides me with the opportunity to give others what I know is appreciated during their time away: food (of course! ), love and attention. I was born in Ukraine. I was a dancer, then I was a dance teacher. But I always loved animals. I have worked as a pet sitter for over 10 years with Dog Days & Cat Naps and I am really enjoying my job. I love to dance, hike, to play piano, to read a book and more. I am the owner of 2 dogs, 3 cats, and 2 birds. Hi! I work as a Veterinary Technician full time. I have 1 dog, Emerald, and 2 cats, Diamond and Crystal. I've been working in the veterinary field for over 10 years and I am currently in school working towards my Bachelor's in Veterinary Management. I have been pet sitting with Dog Days & Cat Naps since 2014 and will take excellent care of your furry family members! Hi, I’m Courtney and I am a Pet Sitter with Dog Days & Cat Naps as well as being one of our newest pet sitters. I have been with Dog Days & Cat Naps since July of this year(2018)! I am currently pursuing a Associates degree in nursing at St. Johns River State College as well. I have many years of experience in caring for pets of all kinds. From dogs and cats to fish, reptiles and more! I’m very excited to be able to assist our clients as well as spend time with their babies! I recently added a new edition to our family, siberian husky Alexis. I also have a very spoiled shih tzu named Gizmo. You can be sure that if your pets are in my care they will be well-loved and taken care of! Elizabeth is an educator and pet lover. She recently moved to Jacksonville from Athens GA and has been working for Dog Days since August 2017. Elizabeth has been pet sitting on and off for nearly a decade. Hi, I'm Brooke. I moved to St. Augustine 3 years ago from West Palm Beach, to continue my education is ASL Interpreting at UNF. I have had pets my entire life and have always been an animal lover. I truly believe they make a house feel like home. I also worked for an Emergency Veterinary Hospital for 3 years in South Florida. I am so happy to have Joined Dog Days and Cat Naps. It is a truly rewarding experience to take care or your pets. I want to make sure you and your furry family members feel completely comfortable and well taken care of. I look forward to meeting you and your beloved animals. My name is Georgeanne! I have been working as a pet sitter for about 2 years. I began in this business back in Michigan which is my home state. I love the extra time I get to spend with the animals in the this job. I do dog walking, pet sitting(daily visits), and overnight sitting. My full time job is as a personal trainer so the flexibility of that job allows me to work at Dog Days and Cat Naps which is awesome! I would love for the opportunity to care for your pet and keep them happy while you are away!